Prepare for Skype video bots to take over your life, as Microsoft promises to use Cortana to create "a truly unbounded personal assistant" at Build 2016. It sees chat applications as the most ultimate, rich canvas to insert its helping hands, by providing video mail transcripts and deploying third-party bots to pave the way for futuristic shopping and planning services. 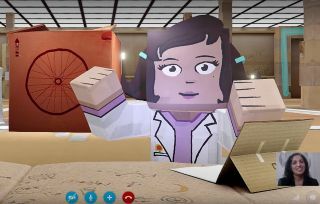 A demo for this next-generation version of Skype was able to convert a short video message into text for Lilian Rincon, the Microsoft employee in charge of the demo. She was able to read the transcript, respond with new emojis and tap on highlighted words to trigger a wide range of information cards from Cortana automatically. You think you're good at multi-tasking? Skype information cards are powered by Bing, and bring contextual data like directions and background information to you without the extra step of leaving the chat to search. At any time, Cortana can chime in, relaying questions from third-party chat bots. "I got a message from Cups and Cakes Bot," said Cortana, asking to share Rincon's current location for delivery. What's sweeter than automatic cupcake delivery and tracking? Cortana also acts as an agent, making all sorts of reservations with businesses. For example, hotels can be booked in this same conversation. Cortana will loop in the third-party Westin Hotel bot, for example, and that's simply based on prior visits, blocked off calendar dates and prior chats. Cortana can also remind you to message a friend about your travels. All of this can be done through an app, but Microsoft promises that Cortana is always on hand to do it faster on all platforms, including iOS, Android, Mac the web and even Windows 10 Mobile. This is good news for Skype's 300 million monthly users who make 3 billion minutes of voice calls everyday, according to Microsoft. At the very end, Microsoft teased that it's also bringing intelligence to our virtual conversations with Skype for HoloLens. Its short video clip showed nifty ways to video chat with people around the world while wearing the headset, and even make real-time annotations in the air, like you would on the screen of a Microsoft Surface Pro 4. What the company still hasn't shown is how the person wearing the headset is being seen by the three-person family on the other end of that call. However it works, expect it to look awkward.